Aamos (just like his father) has always been into Gnomes, but for the past months he has started digging also Trolls. As a fee-minded father I have decided to let him play with them (Trolls don't bite, do they? ), within certain boundaries. After all, you can't decide what/who you wanna hack with when you are older unless you try, right? 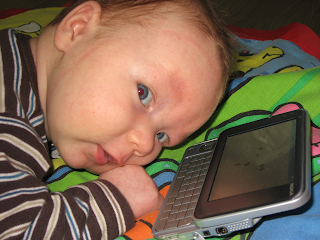 Aamos is still too young to sit (babies should not be standing/sitting on their own until ~3 months old), so today he decided to test Qt in his N810 using QTablet. This allowed him to enjoy Colliding Mice while laying on his playing carpet. I'm quite positive that after this he will open terminal in N810 and use vi to create some cool experiments testing the limits of Qt 4.4 in N810!